Salvation Factory is a department of Innovation Specialists in the USA Eastern Territory. It is an imaginarium in which engineers of Salvationism focus on innovation in research, development and design, providing resources and training which support and enhance the mission of The Salvation Army. 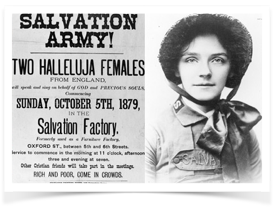 The term “Salvation Factory” has its roots in Salvation Army history. In particular this was the name given to the first Salvation Army Corps in the United States by the Shirley family in 1879. A ‘factory’ is a place where production takes place. Pairing the word ‘factory’ with ‘Salvation’ denotes our goal as stated in our purpose statement. ‘Salvation Factory’ is a place where a group of people are set aside to focus chiefly on the production and distribution of innovative resources and training tailored for use in The Salvation Army.